It’s Sunday afternoon, 18 hours after Pacquiao-Bradley ended in a controversial split decision. I’ve been gathering and studying the round by round “returns” all day — first the official judges scorecards, then the available Press Row unofficial scorecards, then the Compubox round by round stats. I’ve loaded everything into a spreadsheet; I’ve got the DVR’d version of the fight queued up — now it’s time to watch it again, knowing the outcome, and with all the data in front of me. What will I discover? I’m keeping an open mind. First — before starting the show, let’s look t what the cards show. The chart above shows clearly that there are certain rounds where the official judges were seeing a totally different fight than the Press Row unofficial scorers were seeing, or Compubox. Key rounds to examine closely are the ones where the official judges are isolated — 2,5,7,9. Pacquiao gets in two good shots int he first thirty seconds. Nothing from Bradley except rangefinder jabs that are not thrown as anything other than a probe. Hard left from Pacquio twice in the first forty seconds. They clinch at 2:19 and this is where Bradley rabbit punches Pacquio four or five times in what becomes one of the two “highlights” that HBO puts out later after the fight. Good left by Pacquiao at 1;50 — nothing from Bradley but jabs. Pacquiao hits with a sharp right at 1:36. At 1:12 Pacquiao misses and Bradley backs him up – nothing appears to land cleanly but Pac ends up briefly on back against the ropes. At :18 Bradley throws a right that Pac appears to block (but mate judges thought it got through?) At :07 Bradley tries a flurry but nothing lands. (Did they think it did?) Right at the bell Pac lands a right, and Bradley lands a glancing right. Two the three judges give the young to Bradley — yet all four Press Row scorers and both Compubox categories (total and power) give the round to Pacquiao. Compubox is still fairly close, with Pac having an 18/15 overall lead and 12/11 in Power Punches. Looking at the way it lays out, it’s almost as if the judges were operating under a mandate that if you see two rounds that are both close, be sure and give one to each fighter — because at the end of round two, all three judges have it 1 round each for Pac and Bradley, whereas it’s Pac 2-0 on every other card except the LA Times. So … this round is a bit of an anomaly — but not a “smoking gun”. At the beginning of Round 3 Bradley gets in a straight right to the body and Pacquiao nods and smiles. They trade but Bradley’s punches don’t move Pacquiao, while Pac’s move Bradley for sure. Good shot from Pac at 1:44, crowd facts. Another good flurry from Pac at 1:35. They trade a bit. Body shot from Bradley at 1:02. Pac backs Bradley up into the ropes, forcing him to clinch at :32. They trade at :10 and after Pac gets in two shots, Bradley counters to Manny’s jaw but again, Pac is not affected. Pac hits Bradley with a straight left at :05 This round is unanimously given to Pac across the board, so no issue. This round is completely dominated by Pacquiao. Pac had Bradley badly wobbled and it looks like he might finish him or at least knock him down. The only question is whether it’s a 10-9 or 10-8 round. 10-9 is correct. GReat highlights between rounds — more highlights for Pac in this one round than for Bradley in the entire film. This is a “smoking gun” (or smoking something else) round because it is virtually impossible to understand how anyone could score this round for Bradley. Pac is stalking Bradley, Bradley is dancing. Pac lands a good left at 1:47. Pac gets a big shot at :34, then more after that. They trade at the end and Pacquiao clearly, it seems, gets the better of it. The Compubox numbers are not even close: Pac wins 22/8 in total landed punches, 18/5 in power punches. It is impossible to see how Ross and Ford gave this round to Bradley. What were they thinking? Unanimous round across the board for Pacquiao. At this point it’s not really a contest — Pacquiao seems to almost be toying with him. He’s in complete command. He smiles at the ringside announcers at one point. There seems to be no real threat from Bradley to Pacquiao — it’s just question of, will Pac be able to knock him out. ROUND 7 This round is a major, major anomaly. All three judges call the round for Bradley but no one else does — all four Press Row, and both Compubox Categories line up for Pacquiao and Compubox isn’t even close. 27/11 in total shots and 22/9 in power shots. So what did the judges see in this round that no one else saw? Bradley comes out — jab, jab, jab. These are not actual punches, they are taps. Then he rushes pacquao at 2:45 and doesn’t land anything, then clinches. So for the first 20 seconds Bradley is the aggressor but he lands nothing. Bradley lands a body shot at 2:29. Around 2:00 they trade a bit – no real advantage. Bradley throws a right at 1:50 that clearly misses, flashing past Pac’s neck. (Did the judges think it landed?) Manny lands two good shots coming off a linch at 1:40 — not major, but cleaner than anything Bradley has landed. Good flurry in Pac’s favor at 1:11, backs Bradley up. Then Bradley backs Pacquiao up. They trade some more along the ropes at 1:03 — no real advantage. Pac hits Bradley with a clean left at :41. Another good shot from Pac at :38. Lampley notes “Pac seems to be bleeding int he mouth and may have a cut.” Pac get’s another clean shot in at :32. Neither one really gets a complete advantage at any point but the only clean shots come from Pac, and the stats are way in his favor — 27/11 total shots, 22/9 power shots. How do all three judges give this to Bradley when no one else does, and compubox is one-sidedly in favor of Pacquiao? Bradley fires a jab to the face which many blocks; then one to the body that hits Pac lightly with no force; then fires two jabs up the middle which Pac seems to block at 2:30. Pac stalks Bradley for the next 20 seconds, then they trade. No clear advantage. Pac rushes at 1:40, gets in a good right, and a left , and another solid left at 1:32. Pac and Bradley trade on the ropes with Pac the aggressor. Bradley first a counter right that glances of Pac’s ear but Lampley and Bradley act as if it might have landed. (Does Ford think it landed – replay shows it clearly didn’t.) Pac drives Bradley back. Flurry at the end favors Pacquiao, but this round is one which, while the stats favor Pacquiao, is not an outrage to go to Bradley. 15/9 total, 12/7 power in favor of Pacquiao. One pattern that seems to emerging, though, is that Ford — the dean of Nevada judges — seems to be giving Bradley rounds at ever opportunity, Round 1 and Round 8 being two rounds where he is the sole official judging giving the round to Bradley. 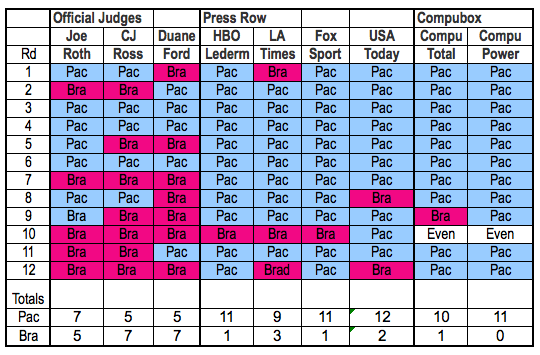 But in each case, 1 of four Press Row unofficial judges gave the round to Bradley, so he’s not completely isolated. If you’re wondering why the Compubox chart is suddenly pink, that’s because this is the ONLY round in the entire fight where Bradley won either of the two compubox categories — Total shots or Power Shots. in this case, he edges out Pac 26/25 in total shots. Pac lands big straight left at 2:32 that rocks Bradley back. He has done this repeatedly and Bradley has yet to “rock” Pac with any shot. At 2:11 Bradley goes badly off balance — looks bad, but not significant. Bradley is dancing away from Pac, who is the aggressor at 2:04. Pac gets off a flurry at 1:48, lands a body shot and left hook — both are better than anything Bradley has landed. Pac gets in another good left at 1:43. And another left, and right, in the same exchange. Bradley got in nothing on that exchange. Pac lands 3-4 shots on the inside. They break. Bradley gets in 2-3 punches that are hardly punches, no effect on Pac. At 1:12. At 1:09 Bradley flurries and one shot lands on Pac’s chin, doesn’t snap his head at all. On a clinch at :54 Bradley gets in an uppercut. At 45 Bradley throws a right that Pac blocks with his gloves, then Pac counters up the middle and gets one through to Bradley’s chin. They trade around :25. I have to say this — none of Bradley’s shots, when they do get through, seem to have any impact at all. He doesn’t look like he’s really throwing them to hurt … they are just not really relevant. His 21 “power shots” in the round have no power and all four Press Row judges seem to grasp that. But not Ross and Ford, who seem bent on treating a hard shot by Pac that rocks Bradley the same as a pillow shot from Bradley that has no effect on Pac. [Between rounds Lampley, Steward, and Kellerman all confirm they have it 9-0 for Pacquiao, as does Lederman] At 2:25 Bradley lands a flurry – best combination of the fight. Pac ignores it but if you’re just counting touches, he gets 3 in the flurry. … at 2:15 Bradley does it again. Lampley and Kellerman and Steward are talking about how Pac is toying with Bradley; how it doesn’t seem Pac is threatened at all. Steward says “Bradley has done enough to win the round but he hasn’t done any damage.” Lampley: “Clearly Bradley’s best round.” After the round Roach says “You let that round go.” Seems real consensus that Bradley got this round. “Another good round for Manny Pacquiao. It seems to be a foregone conclusion.” The atmosphere in the ring is that this is garbage time — it’s over, there’s no sense whatsoever in the arena that the outcome is in doubt. Pac gets in a good shot at 2:20. Bradley using his jab fairly well. Pac stalks ….Bradley counters. The round doesn’t have a clear character. They trade. Steward thinks Bradley is winning the round with 22 seconds to go. Pac gets in a rush at the end. After the fight there is no sense whatsoever that anything other than a Pacquiao unanimous decision is coming. When Michael Buffer announces it, he does something peculiar. He does not announce “we have a majority decision” — he just starts right in with: “Judge Joe Roth has it 115-113 for Pacquiao”. Crowd roars at Pacquiao’s name. “Judge CJ Ross scores it 115-113 for Bradley” — roar of disapproval. And then: “Judge Duane Ford scores it…” for Bradley, of course. There is a tendency in a situation like this to react with your gut — in a way, just as Lampley, Steward, and Lederman did, because they have to — they are doing a live broadcast. When I watched it live, I was incredulous. Now, I’ve spent the better part of a day breaking down all the scoring–official, Press Row, and Compubox–and have laid it all out as you can see above, and have gone through it round by round. Is the decision any more understandable? In the Pacquiao-Marquez 3 fight, when I did the same exercise, it became apparent that what was happening was that the judges were rewarding Manny Pacquiao for volume punching and aggressiveness, while the Press Row scorers were rewarding Marquez for effective power punches. And you could look at the Compubox figures and see the correlation. But in this fight, there is no correlation. There is no reasonable way to explain the judges scoring of rounds 2,5, and 7. It just makes no understandable sense. The other rounds — yes. But 2,5, and 7 are unanimous Pac rounds by every measure EXCEPT the official scorers. And especially, especially 5 and 7. That’s it for this analysis.